This is a cowboy sketch that I was working on over the holiday as I had a chance. I didn't get finished but I wanted to share what I have done so far. I will probably share the finished drawing when it is completed. I guess this could be called a bronco buster cowboy or rodeo drawing. I am not sure what to label this as but if you have some input I would appreciate it. I would never climb on a bronco and attempt to hang on while the wild horse tried to buck me off of its back. I am sure I would immediately fall very hard and hurt myself badly and probably wish I had never laid eyes on a rodeo horse. I hope you had a great holiday and a good new year! Here is my winter solstice Christmas theme artwork. I wanted to add a Christmas deer and a Santa type elf looking character. I am working with a lot of children book style art here lately so I hope you appreciate the style. I also wanted to post this art during the Winter Solstice time just to keep up with the seasonal postings and incorporate some art as well. I hope this post finds you well and you are having a great winter solstice. Please feel free to leave a comment below and share my art if you want. Thank you so much for taking the time to read this and I hope you have a blessed day! Each year as the Christmas season happens it can be a stressful time. People seem to be in such a hurry. I believe it is just a rush to get everything together, buy gifts for everyone we can, and simply just hurry up and relax with loved ones. The past year for you may have been filled with things you were not expecting at all. It may have been a very trying time for you as well. Hopefully it has all gone perfectly for you and this past year has been one of your best. No matter the year you have experienced it is my wish for you to have a great holiday and also to have a great 2019. If I can encourage you to keep looking for something better in your future. Keep you hopes up and your dreams fresh. May you have a blessed holiday season and my many blessings and good things happen to you in the new year. Keep your thumbs up no matter how stressful life gets. This character is very funny. I have watched the first Deadpool movie but I have not seen the second movie. Ryan Reynolds does a great job playing this character. Remember to keep on keeping on and to stay positive no matter what! 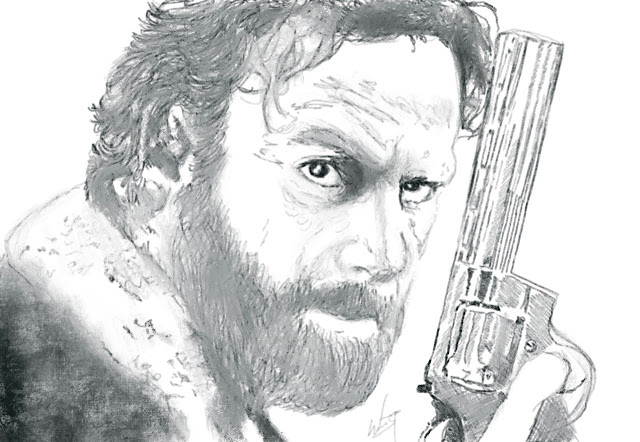 I wanted to share a sketch I did of Rick Grimes from The Walking Dead. This sketch is really just me taking a little break from work at home and work outside of home. It helps me to relieve tension just to stop and sketch. I really hate how they ended Rick Grimes. I love AMC and think it is one of the best entertainment companies around. They consistently produce great shows. If you are a Walking Dead fan I would love to hear from you about Rick's departure from the show. I really have high hopes of seeing him again in the future. The show kind of seems out of sorts at this point. Is the show dying down and losing steam? I really hope not but I don't see how much further the show can go on. Being a super fan of the show I hate to even admit it but I am just hoping for more of a push for me to keep my excitement about the show. I will keep on watching until the very end. Keep on keeping on AMC with the Walking Dead. I am very excited to share my children's book that I am working on! We love our puppies and as anyone knows when you love your puppies and take care of them you must deal with dog hair. The aim of this children's book is to share imaginatively what children might think about dog hair. Dog hair gets everywhere and unless you constantly clean it will create quite the mess. I hope you enjoy this book and I would love to hear what you think about the idea in general. I will be writing and illustrating this book myself. I plan to make this book available on print as well as ebook for Amazon Kindle. Thank you so much for reading about my new children's book that will be published very soon! I would love to hear what you think about my creations. Robert F. West Copyright 2018-2019. Simple theme. Theme images by luoman. Powered by Blogger.